The series was formerly known as the UBCIM series (Universal Bibliographic Control and International MARC). Volumes are available in print or electronic format. For IFLA member discounts to the series, please see Member Benefits. NOTE: Detailed information about the volumes in this series is available directly from the publisher's website. Orders for individual volumes can be placed with the publisher (see also Order Details). Price: EUR 128,00 (EUR 108,00 for IFLA Members). Euro 84.00 / for USA, Canada, Mexico US$ 118.00. München: Saur, 2007, 133 p.
München: Saur, 2006, 197 p.
IFLA Cataloguing Principles, Part 2. Report from the 2nd Meeting of Experts on an International Cataloguing Code, Buenos Aires, Argentina 2004. Edited by / Editado por: Barbara B. Tillett and Ana Lupe Cristán. München: Saur, 2005, 227 p.
(München: Saur, 2005, 61 p.
Cataloguing Code, Frankfurt 2003. 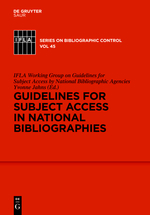 (IFLA Series on Bibliographic Control; vol. 26). Edited by Barbara B. Tillett, Renate Gömpel and Susanne Oehlschläger. München: Saur, 2004, IV, 286 p.
Ed. by McIlwaine, I.C. 2003. ISBD(CR): International Standard Bibliographic Description for Serials and Other Continuing Resources. Revised from the ISBD(S): International Standard Bibliographic Description for Serials. 2002. xi, 112 p. Hardbound. Principles Underlying Subject Heading Languages (SHLs). Edited by Maria Inês Lopes, Julianne Beall. Working Group on Principles Underlying Subject Heading Languages. Approved by the Standing Committee of the IFLA Section on Classification and Indexing. 1999. X, 183 pages. Hardbound. Application of UNIMARC to Multinational Databases: Feasability Report. Edited by Bayerische Staatsbibliothek and Consortium of European Research Libraries. IFLA Study Group on the Functional Requirements for Bibliographic Records. Approved by the Standing Committee of the IFLA Section on Cataloguing. 1998. VIII, 136 pages. Hardbound. An Annotated Guide to Current National Bibliographies. Edited by Barbara L. Bell. 2nd comp. rev. edition 1997. XXVII, 487 pages. ISBD(ER): International Standard Bibliographic Description for Electronic Resources. Revised from the ISBD(CF) International Standard Bibliographic Description for Computer Files. Recommended by the ISBD(CF) Review Group. 1997. X, 109 pages. Hardbound. 4th rev. and enl. edition 1996. XII, 263 pages. Subject Indexing: Principles and Practices in the 90's. Proceedings of the IFLA Satellite Meeting Held in Lisbon, Portugal, 17-18 August 1993. Sponsored by the IFLA Section on Classification and Indexing and the Instituto da Biblioteca Nacional e do Livro, Lisbon, Portugal. 1995. X, 302 pages. Hardbound. 2nd edition 1994. IV, 496 pages. Loose leaf. Guidelines for Subject Authority and Reference Entries. Working Group on "Guidelines for Subject Authority Files" of the Section on Classification and Indexing of the IFLA Division of Bibliographic Control. International Cooperation in the Field of Authority Data. An Analytical Study with Recommendations.